Size of this preview: 711 × 599 pixels. Other resolutions: 285 × 240 pixels | 840 × 708 pixels. Fig. 1: Sagittal T1-weighted MR image in plantar flexion showing the "nutcracker-phenomenon”. The os trigonum together with surrounding soft tissues are wedged between talus, calcaneus and tibia. current 15:38, 13 March 2012 840 × 708 (532 KB) Gaelle De Coster (talk | contribs) Fig. 1: Sagittal T1-weighted MR image in plantar flexion showing the "nutcracker-phenomenon”. 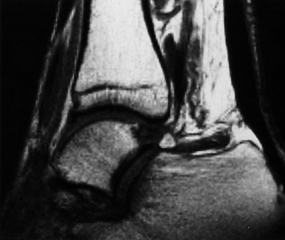 The os trigonum together with surrounding soft tissues are wedged between talus, calcaneus and tibia.